First and foremost, Soloman Cordwell Buenz wanted to design a building that didn’t feel like what would be in Chicago, New York or London; rather, a building that feels like it belongs in Oakland. Solomon Cordwell Buenz is creating a design that merges Oakland’s past with its future. OAKLAND, CA—A new mixed-use building encompasses a full city block located at 2201 Valley St. in the Uptown neighborhood. 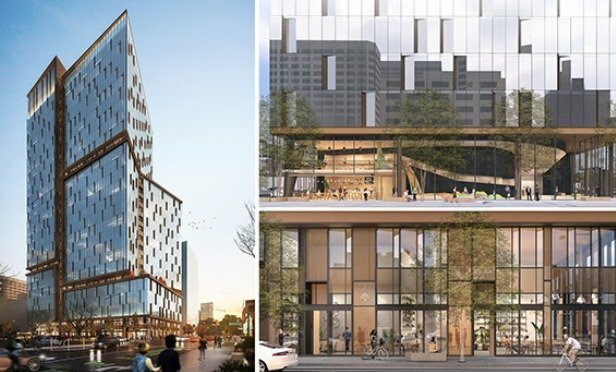 It will replace a parking lot and gas station with a 420-foot-tall office tower with parking, retail, flexible arts space, cafe, green terraces and roof garden.